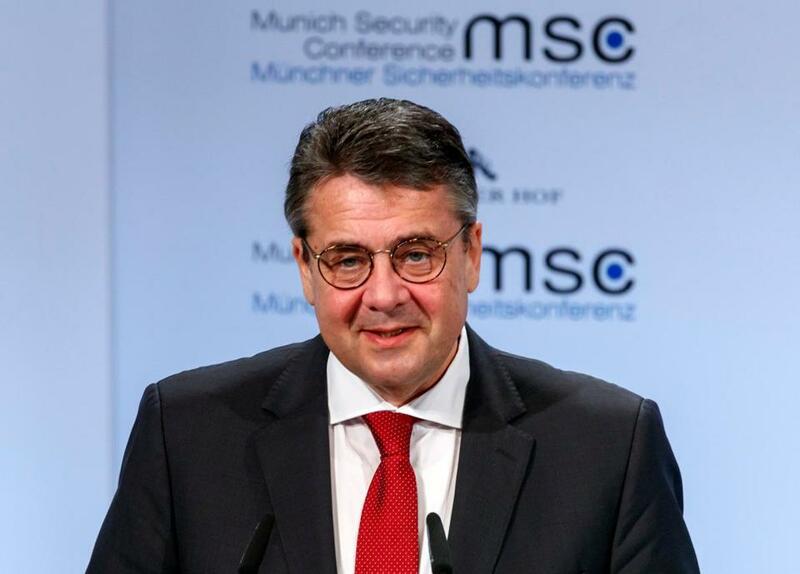 Foreign Minister Sigmar Gabriel of Germany spoke at the Munich Security Conference on Saturday. MUNICH — Foreign Minister Sigmar Gabriel of Germany slammed the ‘‘America first’’ approach of President Trump on Saturday, saying close US ties with a strong European Union are as much in Washington’s interest as they are in Europe’s. Gabriel told world leaders and defense officials at the Munich Security Conference that as the global influence of China and Russia rise, the United States and Europe must return to historical bonds and work together or risk getting left behind. ‘‘Our strength in Europe is not sufficient for this. Neither the EU nor the US can go it alone. We have to count on our friends and our partners,’’ he said. Trump has pushed strongly for more NATO nations to live up to commitments to spend at least 2 percent of their gross domestic product on defense spending. Prime Minister Mateusz Morawiecki of Poland, whose country is one of the five NATO members that does meet the target, said discussing a common European defense policy with other nations is complicated when they are not playing by the same rules. ‘‘I feel very much pro-European. I would like that we live under pax Europa, but this is not the case. It was not the case for 70 years, and it is not the case today,’’ Morawiecki said. No country in Europe has benefited as much from American help as Germany since World War II, Gabriel said. He said the country ‘‘eagerly learned’’ principles of democracy, multilateralism, international law, and free trade from the relationship with the United States. Gabriel suggested the United States was going in the opposite direction, drifting toward approaches taken from powers like China and Russia who are ‘‘constantly trying to test or undermine’’ the EU. In a meeting on the sidelines of the conference Friday, Secretary of Defense James Mattis told Defense Minister Florence Parly of France that a ‘‘strong Europe is a better security partner’’ but emphasized that EU defense initiatives should ‘‘complement, not compete with NATO,’’ the US Defense Department said. Gabriel said there was a need for European nations to work more effectively together so the EU has both the tools and a common strategy to effectively assert its interests globally. He said that while Europe can’t rest simply on a military strategy, it also can’t ignore military and defense spending. ‘‘As the only vegetarian, we would have a problem in the world of carnivores,’’ he said.